Today we had a full day of driving and visiting some local sites. 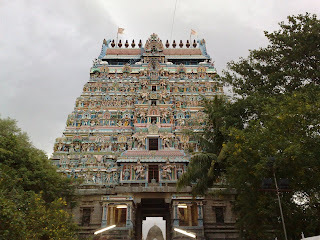 We left our hotel around 8:30am for the 2 hour drive...78 km...to the Chidambaram Temple. 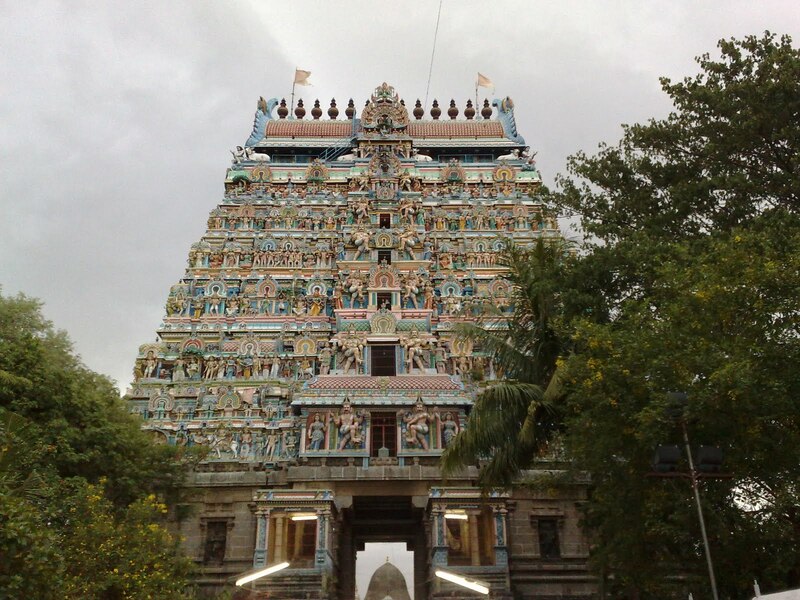 This is a Hindu temple dedicated to Lord Shiva and is one of the five holiest Shiva Temples, each representing one of the five natural elements. All the temples in India are run by the government, however this is the only one run by a group of priests. It is located on about 40-50 acres of land...it's huge!!! The word Chidambaram is derived from chit, meaning "consciousness" and ambaram, meaning "sky"....the sky of consciousness. Lord Shiva is the Lord of the Bharatanatya dance and as you enter the gates of the temple grounds you see images of all 108 dance poses....very interesting really. Before we entered the temple area, we had to check in our shoes....bare feet it was!!! Many sections of the temple grounds were closed and only open during certain times of the year or during certain festivals. The statues of the Gods are washed every day and new saris are placed on them....they are clothed out of respect for them. This is an extremely old temple and many people come here to pray on an ongoing basis. The entire time we were there, we had people coming up to us begging for money. One woman with a baby in her arms followed us for the longest time...she even came right to the door of our bus!! Very sad really. We saw an area that was blocked off that held the 1000 columns....pretty spectacular and we also went to an area where people could bath if they liked....strict rules however. You are not allowed to take photos inside the temples, but I can say there were beautiful carvings in the stone, lots of statues of Gods, people praying and painting drawn on the walls....they are also very dark inside. The main temple...which we only walked through....was filled with people lined up for prayer. Very interesting to see. We left the temple around noon and headed about 20 minutes to Pichavaram which houses the second largest Mangrove forest in the world....2,800 acres. It is an eco-tourism spot and therefore very busy. When we arrived we purchased our tickets and while waiting decided to eat at the hotel restaurant. When we returned we boarded our two boats for a 1 hour boat ride. What a beautiful spot and the perfect day....especially since it poured rain all night and was over cast the entire drive there. At one point we actually turned into the Mangrove forest and followed a narrow path...you really needed to pay attention because lots of the branches came right down to your head and you needed to move out of the way. What a great way to see this beautiful area...very worth it. At about 3pm, we were finished with our boat ride and boarded our bus for the 2 hour drive back to Pondicherry. Along they way we went through various small villages and even came across a funeral procession...we thought it was a parade since there were drums, people dancing and they were dropping flower petals on the road. "No Over Speeding"...doesn't that imply you are currently speeding!! We also saw the traffic police in their little red hats...this comes from the French influence...as well as a boy driving his bike with cotton candy for sale on the back!!! At about 5pm, we arrived back at the hotel.. exhausted and ready for a nap. It was another good day in India and I look forward to our next cultural visit tomorrow.